We love pasta in our house. 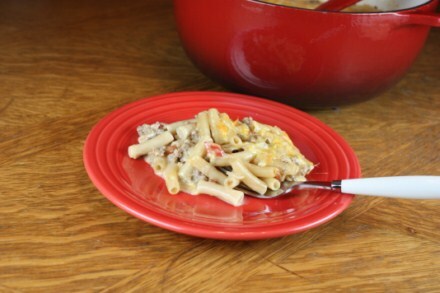 It is usually an inexpensive, quick, and easy meal to make that everyone enjoys. This spicy pasta and sausage is a dish that I came up with recently when I wanted to make something that was a little different than the normal pasta I usually make. We all loved this. The rotel tomatoes help give it some spice, while the cream and cheese give it a nice texture. And I really loved the fact that it was a one pot meal. You will be seeing this on the menu plan again soon. In a large pan cook sausage and onion until the sausage is browned and the onion is tender. Add garlic and cook for 1 minute. Stir in broth, tomatoes, cream, and pasta. Bring to a boil. Reduce heat to a simmer and cover pan. Simmer covered for about 15 minutes or until pasta is tender. Stir in cheese until melted, and serve. This looks delicious!!! I’ll certainly be trying this one! I just made the pasta dinner last night and it was so good! This recipe will be on our family list! @Diane, Thanks for letting me know that your family enjoyed it. I am so glad that they did. Would this be toospicy with ‘hot’ sausage? What about Italian sausage? 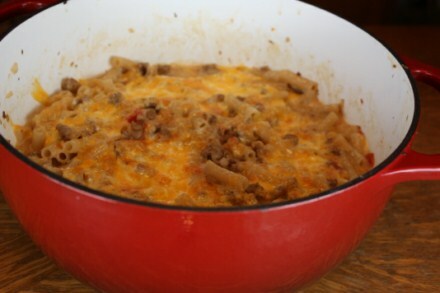 This made me think of Hamburger Helper, but sans all the sketchy ingredients that no one can pronounce – super easy and very yummy! I’m sure it would be great with ground beef too, just to mix things up. I am glad that you enjoyed it! Have you tried the mild rotel? I sometimes by that because not all my kids like spicy things. The mild still has some kick, but not as much as the regular rotel. Ooh… I’ll do that next time! I don’t actually remember why this can of Rotel was in my pantry, but it definitely said “original” on it, so that’s probably what it was. Made this last night with kielbasa type sausage and it was a big hit. Everyone loved it!